The next in my series of obvious conclusions is that movie critics like arty movies better than the general viewing public does. Take a look at the chart to confirm this if you feel a need. So what are “arty” movies? Again, very subjective on my part. Arty mostly refers to the art of movie-making, although I think there are a few movies where the subject matter of the movie is art or artists. I marked as arty any movie that seemed to use non-traditional (or formerly traditional but long out-of-favor) techniques (e.g. silent film, stop-motion, filming over 12 years or with 12 different directors), and movies that critics rather uniformly described as exceptionally artistically done. Since there aren’t too many, I’ll post the entire list at the end. Feel free to disagree with my label; it’s my blog so there’s nothing you can do about it. You can, however, contact me through the contact form on the “About the Author/Contact” link in the top menu. I’m obscure enough that I don’t hear much from readers, and I enjoy exchanging emails with those who do contact me. I allow comments on this blog. I’ve marked a few outliers on the chart. For what it’s worth I liked Departures, My Left Foot, and All Is Lost. I didn’t like O Brother, Where Art Thou? I haven’t seen any of the other labeled ones. This will be the last movie analysis post for awhile, but I plan to keep adding movies and resume the analysis in future posts. There are still some surprises in store. This entry was posted in Uncategorized on February 27, 2015 by Russ. I’ll start with the conclusion here: movie critics are more liberal than the general population. Duh! This probably falls somewhere in the category of bears in the woods and the religion of the pope. Still, now you have data to prove it. 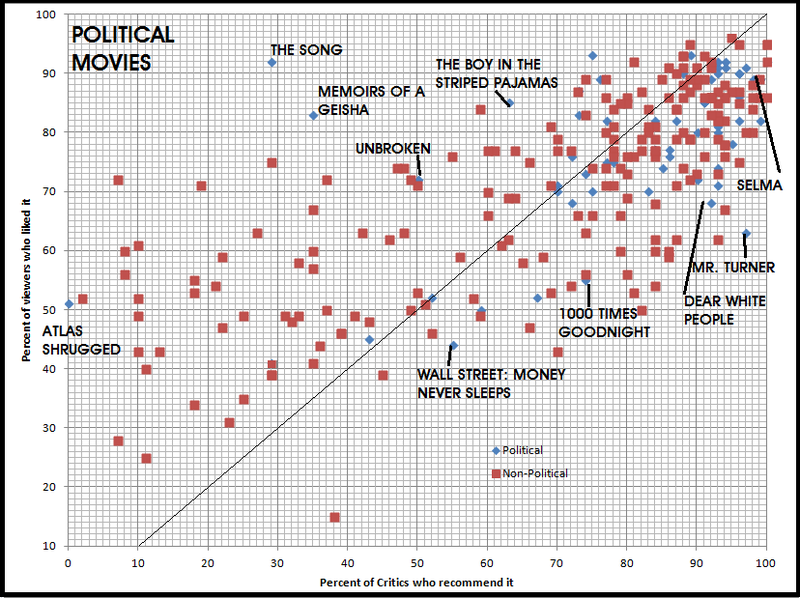 The above chart shows political movies in blue and non-political ones in red. It’s not hard to see that a large majority of the blue diamonds are to the right of the diagonal line, meaning the critics ratings were higher than the viewers’ ratings. That could just mean that critics like political movies more than the general population does, and that’s probably true, too, but more significant is which movies fall on the right and left sides. Before I go on, you may ask how I distinguished between political and non-political. It was a subjective judgment on my part, so feel free to discount the validity, but most were pretty obvious choices. Almost anything that had a strong theme related to traditional GOP-Dem type politics was included, but I also included anything heavily themed on social issues that are controversial or divisive, such as race relations, drugs, religion, women’s rights, and sexual orientation. Examples are Selma and Dallas Buyers Club. Less obvious are the ones I included because they were controversial or political within a particular community, even if not among the general public, such as Temple Grandin and Kon-Tiki. Most documentaries, fact-based (or “inspired”) movies, and biopics were included because they almost all dealt with controversial events or people. In case you’ve noticed some dots on this chart that weren’t there in yesterday’s, that’s because I used a larger percent of my database in order to include more political movies. 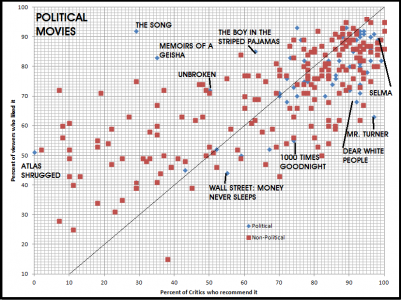 Political movies in general had fewer viewers. I’ve labeled most of the notable outliers, i.e. where the greatest differences are between viewers and critics. Since there are fewer of those on the left side, let’s examine those first. The Boy in the Striped Pajamas and Unbroken are both World War II movies where the Allies are the good guys and the Axis are the bad guys. It’s not difficult to see where these would be more appealing to conservatives than to liberals, but not by a great deal, which is why they rate fairly high with the critics, too. The Song is a faith-based story according to the description. You should be able to figure out which side of the political spectrum that falls on. As for Atlas Shrugged, if you are having trouble understanding why a total of zero critics liked it, go back to Poly Sci 1 or read the book. Perhaps less obvious to some is Memoirs of a Geisha. It’s not inherently political in its subject matter, although the notion of a geisha as an oppressed or exploited woman is not hard to put onto the political scales, but I think it likely offended critics for another type of politics: movie politics. The star was Chinese, not Japanese like the character, and the time frame depicted, spanning world War II, is one in which there was bitter hatred between those two nations. The director, screenwriter, and author of the book on which it is based are all white. I remember reading an article where the Hollywood elite allegedly thought this was an inherently Japanese story that should have been told and acted by Japanese, not their former enemies. I’ll leave to you to look up the movies I’ve labeled on the other side of the line. I don’t think it will be difficult to reach agreement that they are more appealing to liberals than to conservatives. Lastly, we have to explain why the bulk of the blue diamonds falls to the right of the line, much more so than the bulk of movies in general. 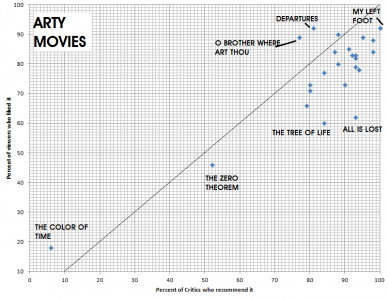 If movies, on average, are basically neutral, or equally biased on both sides, the dots should be more or less equal on both sides, if my premise about critics is true. That one is easy to explain. Movie makers and media people in general are more liberal than the general public. It is not the case that movies are evenly distributed over the political spectrum. A lot more “liberal” movies are made than “conservative” ones. Anyone who follows politics know that it is Democrats who go to Hollywood for campaign funds. Sure, we can point to Ronald Reagan and Clint Eastwood as conservatives, but they’re the exceptions that prove the rule. This entry was posted in Uncategorized on February 26, 2015 by Russ. 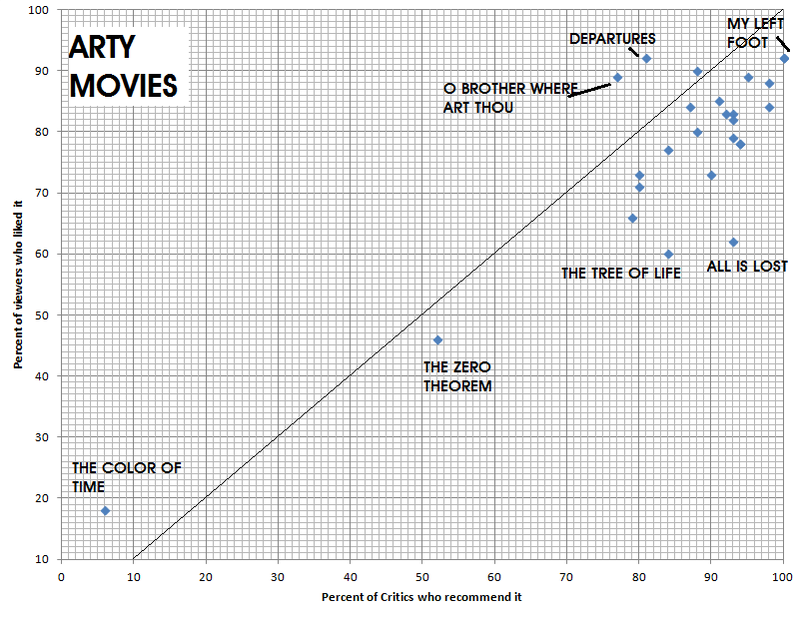 I enjoy playing with data from time to time, and I enjoy movies, so I decided to compare how critics rate movies and how the viewers rate them. Take a look at the above chart. First, for you data hounds and methodology freaks, I’ll describe how I compiled it. All the ratings come from Rotten Tomatoes or Flixster, so neither the critics nor the viewers represent the universe of people in either category. Older (i.e. not so computer/social media savvy) people and foreigners, for example, may not be well represented. The movies to be included come from several sources: the ones I’ve rented or rated in Netflix since January 2011, including ones I streamed; nominees for Best Picture at the academy awards 2011 – 2014; all movies that made the top box office listing either in theaters or rentals according to Rotten Tomatoes for the last three months or so; several lists from major publications of the best all-time movies of several genres, e.g. thrillers. This last category is the only one that includes many older films. I may have rented an occasional older film, but the data is skewed toward newer releases. I acquired data on almost 300 movies but then sorted it to take only the 250 that had the most viewer ratings to eliminate some oddball losers, cult films, etc. I wanted movies with sufficient viewer input to be statistically significant. The cutoff number turned out to be 3400 viewer ratings. The number of viewer ratings correlates highly with box office numbers, but there could be some movies that get an inordinate number of ratings from very avid fans despite mediocre box office success, or limited success in the U.S. All used for this chart also had at least 20 critics’ ratings except for three, which had 8, 10, and 13 on that website. As I understand it, the critics were given only two choices: to “recommend” a movie or not. Viewers could rate on a five-star system, and the website converts that to a single number representing the percentage of viewers who “liked” the movie. That means the percentage who rated it 3.5 stars or higher. These two rating systems are not exactly equivalent, but the percentages of critics who recommend and viewers who “like” a movie are close enough in general to make comparison useful. 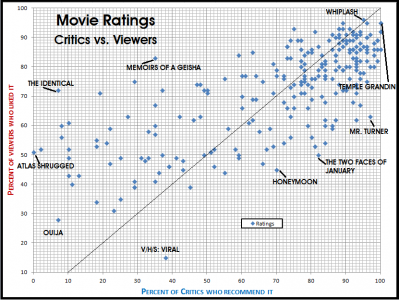 The diagonal line in the chart represents equality in percentages between viewers and critics. Each little blue diamond is the rating for a particular movie (or possibly more than one in the case of identical ratings). So any diamond to the left of the line is a movie that viewers rated higher than the critics and those on the right, the critics liked better. The closer to the upper right corner, the more a movie was a favorite in both categories. So what does this chart show? Not much yet, since I haven’t shown you many movie names or other data, but I threw in a few teasers so you can begin to get an idea of what it could show. 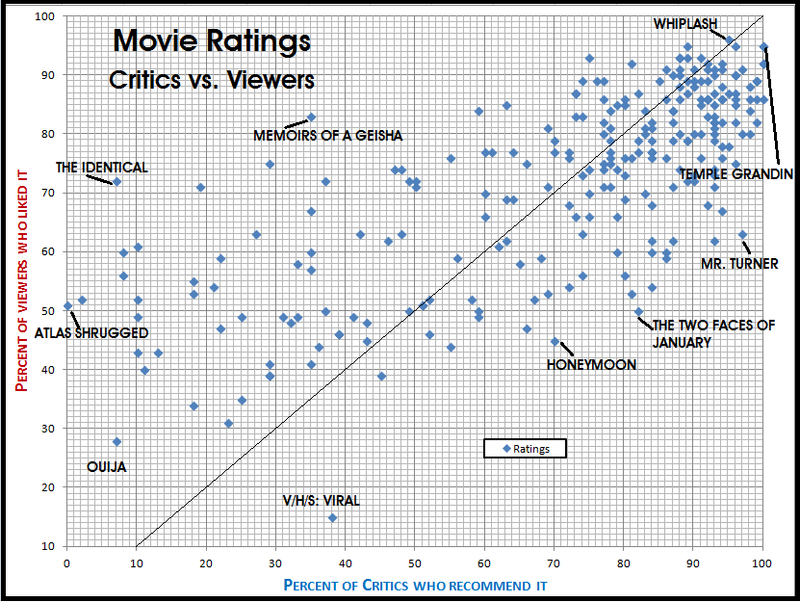 I labeled the ratings for a few of the outliers, that is, movies where the viewers and critics differed the most. What characteristics do you think would be most common in those movies to the far left of the line, i.e. fan favorites that critics hated? How about the other way? I’ll give you one that applies to outliers on both sides of the line: low viewership. Generally speaking, those movies were “specialty” movies that were seen and reviewed by relatively few people. This was not always true, however. Memoirs of a Geisha, for example, was a mainstream movie, although not a box-office smash by any means. Wait! you may say. There’s Temple Grandin up near the corner, quite close to the diagonal line, highly rated by critics and viewers alike, yet it barely made the cutoff in terms of number of viewer ratings. True enough, but there are two reasons for this: first, it’s an older movie (2010) that I happened to rent a couple of years ago, and Rotten Tomatoes wasn’t as widely used back when it came out, and second, it’s a biopic (e.g. biographical in nature) of someone who was not widely known. I’ve found that documentaries and biopics generally got significantly lower viewership numbers than pure fiction movies of all types. Of course there are exceptions. And what about Whiplash, a movie that’s gotten the highest viewer rating of all, and you’ve probably not even heard of it? It’s at the opposite end of the timeline. It’s brand new and I’ve found that when movies first come out, they are generally watched (and rated) by those who are big fans of that particular genre, star, or in some case, series. The viewer ratings are usually high at first, but I can guarantee you that by the time that one comes out on DVD it will be several, maybe many, viewer rating points lower. So don’t put too much credence in the validity of these ratings, especially for brand new releases. So there are a few hints about what the data can show. In future posts I’ll explore some of the interesting correlations I’ve found. I think they’ll surprise you. As a reward for reading all the way to here, I give you a list of the most popular movies (over 100000 viewer ratings) that were rated the highest by viewers and by critics. You may consider putting them on your list. This entry was posted in Uncategorized on February 25, 2015 by Russ. This entry was posted in Uncategorized on February 23, 2015 by Russ. The crime being investigated in this book is a kidnapping, a refreshing change from the usual serial murderer. Mia is the daughter of a wealthy judge; she’s kidnapped by Colin, a ne’er-do-well from the underclass. The story is told primarily by three voices – Mia’s mother, the detective investigating the case, and Colin. The scenes switch back and forth from “Before” and “After”. During the “After” scenes we learn that Mia is back home with her mother months later, but is suffering from a memory loss, so we don’t know what happened between those two nebulous time frames. Some people may find the changing voices and times disturbing or confusing, but I had no trouble following the storyline. The author writes well and I found the characters credible. I’ve always liked seeing the same story told from multiple points of view, but that’s not exactly what happens here. The three characters are each telling different stories, i.e. what they did or what happened to them during the months. The ending has a twist to it that I didn’t anticipate, but I can’t say that contributed much. What makes the book interesting is the way the characters develop. As a former FBI agent I know something about how kidnappings are investigated, although this begins as a missing person case, not a kidnapping. I found the police procedure part to be relatively believable and well-done, better than most such books by non-law enforcement writers. This entry was posted in Uncategorized on February 18, 2015 by Russ. I was geocaching with a friend recently and had my DJI Phantom with me so I took some random video and aerial stills. It was a cold (about 68 degrees F. at 11:00 AM) February day in Redwood City. Ha ha ha. Eat your heart out, Boston! And people wonder why anyone would live in California with our astronomical real estate prices. This entry was posted in Uncategorized on February 17, 2015 by Russ. This entry was posted in Uncategorized on February 11, 2015 by Russ. Maybe you should be following him instead of me. Or both of us. This entry was posted in Uncategorized on February 10, 2015 by Russ. Did you miss the freebie yesterday and Friday for Held for Ransom? You can still get the ebook at a discount: Go to Smashwords.com and use discount code YL69L for 20% off. (http://www.smashwords.com/books/view/97514). Good only until Feb. 15. This entry was posted in Uncategorized on February 8, 2015 by Russ. Still Life is the first Inspector Gamache mystery, a very popular series among mystery readers. This series is set in Quebec but is written in English, although French expressions are used occasionally and the malaise that separates the francophones from the anglophones is depicted at times. The strength of this book is the detailed descriptions of Quebec village life and its people, a geographic and sociological location with which most English-language mystery readers have little familiarity. The characters are fully developed and very diverse. The main character, Gamache, is likeable. The plot line is very much like Agatha Christie’s novels. It fits in the Clue game genre, that is, the possible suspects are limited to a small set of people, in this case the inhabitants of the tiny village of Three Pines. You know from early on that it is one of the characters you are reading about, and the author populates this set with enough characters and motive to keep you guessing. The milieu (see, I took French in high school, too) kept me interested enough to finish the book, and I can honestly say I enjoyed it, but the dénouement left me unsatisfied. The murderer is revealed, of course, but I found the resolution to be all-too-random. It could just as easily have been someone else. It was almost as if the author got to the end and decided it was time to solve the mystery, then drew a name out of a hat and devised an explanation for why and how it was done. A good mystery either contains enough clues to let the astute reader figure out the ending and solve it, or a surprise ending that delights you in its unexpectedness. This did neither. I was perhaps a bit put off a bit by the way Gamache treated his new associate Nichol. She was actually quite realistic and more likely to solve a real case with her approach than Gamache would. So if you’re a fan of ambiance and interesting characters and locales, try a Gamache book. If you prefer a plot-driven mystery with plenty of sleuthing, this may not be the best choice for you. This entry was posted in Uncategorized on February 7, 2015 by Russ. Held for Ransom (Kindle edition) will be free this Friday and Saturday. Spread the word. If you’ve only read the geocaching-themed books, this is your chance to see how Cliff got started, before geocaching existed, to learn about his strengths and frailties, his insecurity. It’s also a very realistic view of what a real kidnapping case is like. You could learn something that could save your life in the unlikely event you became the victim of one. This entry was posted in Uncategorized on February 4, 2015 by Russ. 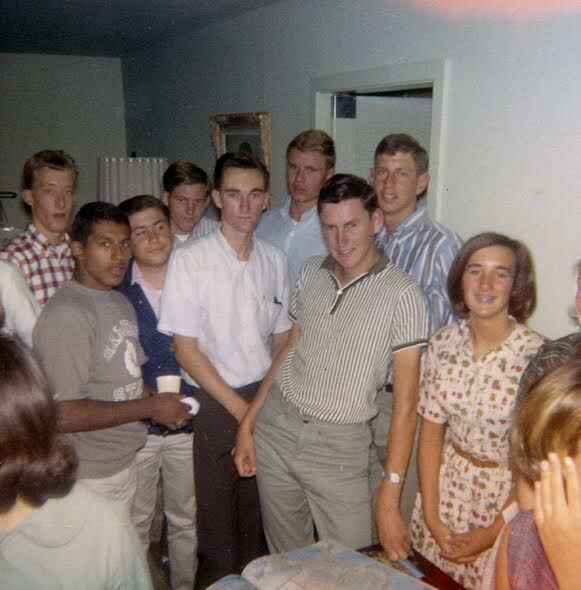 I graduated from high school fifty years ago this June. We’re having a reunion later in the year. I started to write our 50th reunion, but it isn’t, since we’ve only had a few reunions. So I’m calling it our 50-year reunion. I am a word fanatic, after all. Below is a photo of me along with several of my classmates. I’ll let you guess who is who. This entry was posted in Uncategorized on February 3, 2015 by Russ. I’m not a big pro sports fan, but I enjoy a good football game, and yesterday’s Superbowl certainly met that description. I noticed something during the game that I’ve seen before while watching pro football. The announcers mentioned during the game that Richard Sherman of the Seahawks went to Stanford. They also mentioned that another player, one whose name I’ve forgotten (there are others on both teams), had also gone to Stanford. Yet at no time did they mention that either Marshawn Lynch or Shane Vereen, the two star running backs for the opposing teams, had gone to the University of California, Berkeley (Cal). Both played much more of a role in the game than Sherman or the other Stanford player. The comments were elitist at best, and possibly even racist. The implication was that these players weren’t just dumb jocks as you might expect because, hey, they went to Stanford. There may even have been an unintentional hint that it was surprising because they were black “speed” players in “non-cerebral” positions, i.e. anywhere besides quarterback, I suppose. However, this racist tinge may not have been behind it, since Lynch and Vereen are black, too. I think the announcers or copy writers simply had a perception that an athlete has to be unusually smart to go to Stanford, which makes the mention of their school noteworthy, whereas the others went to Cal, which is “only” a public university, and we all know any dumb jock can get into Cal, right? Wrong! Wrong on both counts. As anyone who has ever followed college football knows, the top football schools, public or private, let in a ton (literally) of players on athletic scholarships who are nowhere near capable of entering the school on their grades or test scores. Plenty of semi-literate morons have gone to “elite” private schools to play football. O.J. Simpson is a notable example at USC, and don’t get me started on Notre Dame. On the other hand, all the top athletic schools have examples of highly intelligent athletes, of all races. I am reminded of Kareem Abdul Jabbar, a UCLA graduate and probably the best basketball player of all time, who spoke at my son’s graduation. Jabbar was by far the best graduation speaker I’ve ever heard – articulate, witty, poised, with perfect grammar and a large vocabulary. For those acronym-challenged, UCLA is part of the public University of California system, like Cal. True, Stanford has a lower admission rate than Cal now, making it harder to get into. In fact, it’s harder to get into than any university in the country, including the Ivy League, but that doesn’t make it tops academically. Cal still has more Nobel Laureates than Stanford and is extremely selective in admissions with only a 17% admission rate, and that’s with a statutory requirement that the university system must accept the top 10% of each high school’s graduates if they apply. In other words, if your child graduates in the top 10% of his or her California high school class, the university must admit him or her (although not necessarily the campus of first choice). So, announcers, how about some equal time for Cal if you’re going to mention schools. I’ve never met Sherman, Lynch, or Vereen or even heard them interviewed. I don’t know how smart, dumb, or educated they are and it doesn’t matter to me. They’re all great football players who made for good entertainment from time to time. They do their jobs just fine. The television announcers? Well, I’m not so impressed with their intelligence. Thank God for the mute button. This entry was posted in Uncategorized on February 2, 2015 by Russ. This entry was posted in Uncategorized on February 1, 2015 by Russ.